Assault and battery are treated as two separate crimes in New Mexico, with one more severe in punishment than the other. Regardless, the lines become fuzzy for most defendants when charged with either crime – and what you might think is an assault act becomes a battery act instead. Knowing the difference as defined by the law is one thing, but understanding real examples helps you better understand how you can be charged with either of these crimes. Both charges are serious, and they can result in several months to over a year in jail, depending on which you are charged with and if you have any aggravating factors. In New Mexico, assault is defined as an attempt to commit battery on another person, threatening a person, or using assaulting language. You do not have to strike someone to be charged with assault. If you do use a deadly weapon while committing an assault act, it becomes aggravated assault. Battery is a misdemeanor, but still, one that can include up to six months in jail. Battery is touching someone unlawfully or applying force to another person. Aggravated battery is when that touching or force involves a weapon or results in great bodily harm. What Are Examples of Assault? To help you better understand the definition of each crime as the state sees it, we have examples compiled for the various scenarios. Note that these are merely examples, and your actions could fall outside of the scope and still be classified as one or the other. You may not physically touch that person, but if you were to tell someone “I am going to kill you!” you could be charged with assault. The caveat is that the victim must have a genuine fear that you are going to follow through with the act. Merely joking and spouting these words is not assault. Instead, you must exhibit intent, and the victim must have a reasonable fear you would carry out the act you have just threatened. Now you may face aggravated assault charges. Note that a “deadly weapon” does not just involve the obvious guns and knives. Instead, anything that could be used to cause great bodily harm may classify as a deadly weapon – such as a baseball bat. Threatening someone and pointing that weapon at them (regardless of the weapon) and the victim having a reasonable fear you would carry out that threat, can result in aggravated assault. You may have intended to punch someone, but you swung and missed your strike. Before you could try again, you were apprehended. In this case, you did not physically attack them, but you attempted to commit battery; therefore, you are charged with assault. Words are potent, and when you use language that threatens someone’s reputation, you may also be charged with assault. You do not have to threaten violence against them in this circumstance either. If you disguise your appearance and make threatening statements to someone, you will be charged with aggravated assault. Aggravated assault is a fourth-degree felony, which means wearing a mask to taunt or threaten went from six months in jail to now an 18-month prison sentence and a felony record. In the heat of an argument, you get upset and your anger causes you to throw an object violently at the other person with the hope it will strike. You have now just committed assault and possibly aggravated assault, depending on the circumstances. 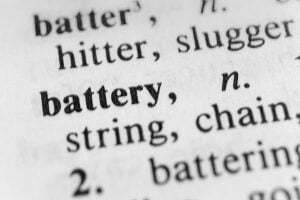 What Are Examples of Battery? Battery is more physical, and instead of threatening violent acts, you are committing them. People often do not realize nursing home abuse is a form of battery. When someone punches, pushes, kicks, pinches, and slaps another person, they have committed battery. In a nursing home setting, if a caretaker does these acts with the intent of harming the patient (which is often the case with nursing home abuse), they may face aggravated battery charges. A woman is walking alone late at night when a man jumps out and pulls her into the bushes. He strikes her repeatedly and tries to rip her clothes off. Before he can commit a sexual assault, the victim gets away. In this case, the attacker may face aggravated battery charges, because he struck her violently with the intent of harming her and may also face sexual assault charges, too. Touching a person that does not invite touching or blatantly says to stop is battery. For example, going by a coworker’s desk and continually pinching, slapping, or punching them, when the force is strong enough to hurt them and your intent is to hurt them, would constitute battery. Just grabbing and restraining someone physically can constitute battery, especially if you are using it as a means to control them or harm them later. Assault and battery charges are serious, and if you are convicted, you could find that your life has changed entirely. You may disqualify for aid, be unable to get a job in certain professions, and even have limited housing options. If you were accused of either, do not assume that, because you are facing a misdemeanor, it is nothing to worry about. A criminal record does follow you the rest of your life. Let the attorneys at New Mexico Criminals Law Offices help you fight these charges and avoid the long-term consequences. We have helped countless clients just like you fight similar charges before. Schedule a free case evaluation now at 505-200-2982 or request more information online. "I hired Jack because I had no where else to turn. My other Attorney had refused to help me and said that I couldn't possibly get my unsupervised probation dismissed and my rights granted back to me early. I had been on supervised probation for 5 years without any violations and wanted to get off of my unsupervised probation so I could resume my life without any further complications. Jack got the job done and my life is back to normal. I was so aggravated that my previous attorney wanted $3,500 to file this simple motion and basically told me that it wasn't going to happen, and that it was a waste of my time. Jack charged me much much less and was confident I would get a favorable outcome. New Mexico Criminal Law Offices are the only place people need to contact if they get into trouble with the law. I can't thank them, Jack specifically, enough for helping me with my case." to contact our law offices.